Crocodiles are large, hostile reptiles that can be found near water. A series of two melee attacks that do minor physical damage. A melee attack that does moderate physical damage. The crocodile swings its tail, doing moderate physical damage to all enemies in front of it as indicated by a red cone. Gathongor the Mauler, a larger-than-usual crocodile that is the boss at Gathongor's Mire. 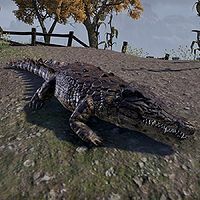 A Predator's Heart: Help an old Argonian transform into a crocodile. School Daze: Help new students pass their entrance tests. Uncaged: Seal an ancient laboratory filled with angry Celestials. Auridon — The second-largest island in the Summerset Isles and the location of Firsthold, one of the largest Aldmeri cities in the world. Bangkorai — A region connecting the northern reaches of Hammerfell with the east of High Rock. Coldharbour — Molag Bal's realm of Oblivion. Craglorn — A region situated in northeastern Hammerfell between Bangkorai and Cyrodiil. Cyrodiil — The central province of Tamriel and home of the Imperials, who stand alone in the Alliance War. Glenumbra — A region in High Rock covering the entire peninsula that separates Iliac Bay from the Eltheric Ocean. Grahtwood — A large region deep in the jungles of Valenwood, and the location of the Aldmeri Dominion's capital, Elden Root. Greenshade — A large region of western Valenwood, lush with life under its canopy with rivers coursing through the land. Harena Hypogeum — The section of the Imperial Sewers closest to Ebonheart Pact territory. Hew's Bane — A peninsula in southern Khefrem on the south coast of Hammerfell. Irrigation Tunnels — The section of the Imperial Sewers closest to Aldmeri Dominion territory. Malabal Tor — A region deep in the jungles of northwestern Valenwood, where little light reaches the forest floor. Reaper's March — A region connecting the jungles of Valenwood and the rolling plains of Elsweyr. Shadowfen — The northwestern region of Black Marsh. Stormhaven — The south-central region of High Rock. Wayrest Sewers I — A group dungeon found under the city of Wayrest in Stormhaven. This page was last modified on 8 July 2018, at 10:16.